This location shows a wonderful section of the Filo Delgado overlying the Tara ignimbrite. The Filo Delgado Ignimbrite is the youngest unit and contains those distinguishable fiamme of obsidian . 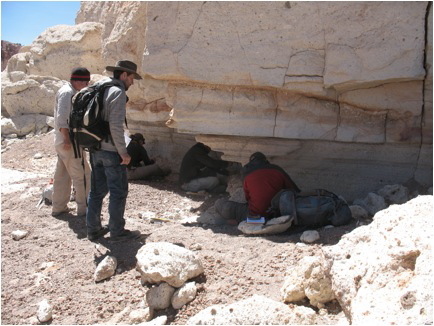 The middle unit is the Filo Delgado fall deposit that contains banded rhyolites, obsidian clasts and is dominated by lithics. The oldest deposit, underlying the Filo Delgado is the Tara ignimbrite that has an ashy matrix , lithics, and no obsidian and/or rhyolite. It was questionable whether the fall deposit should be associated with the overlying Filo Deglado or with the underlying Tara ignimbrite. Because the plinian contains obsidian and rhyolite, it has been suggested to be part of the Filo Delgado deposit. This is a great location for seeing the Guacha of the Lower Tara ignimbrite, also known as “Big Yellow” because of its yellow color. The Lower Tara fills in the depressions in the area and outcrops horizontally as a flat plane. In this location units 4 & 5 of the Tara lie directly above the Guacha. After driving around the area searching for the Plinian deposit of the Tara, we finally found a great exposure of the airfall at this location! 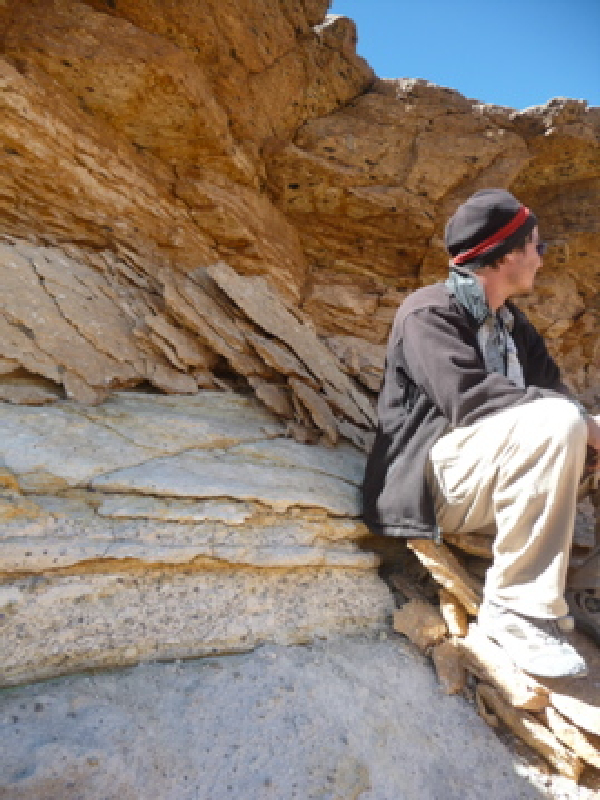 The Tara Plinian fall deposit contains abundant pumices with quartz, plagioclase, biotite and magnetite crystals. While the crystals may not appear immediately apparent, with a closer look they are actually found in clusters and are quite coarse. The pumice shows variations in vesicularity, some appear silky and others more gas rich.